Enterococci are gram-positive bacteria occurring in a remarkable array of environments. They can be found in soil, food, and water, and make up a significant portion of the normal gut flora of humans and animals. As other bacteria of the gut flora, enterococci can also cause infectious diseases. On the other hand enterococci are used as probiotics to improve the microbial balance of the intestine, or as a treatment for gastroenteritis in humans and animals. So far, 35 species have been proposed for inclusion in the genus Enterococcus considered the most controversial group of lactic acid bacteria. Studies on the microbiota of many traditional cheeses, especially in the Mediterranean countries, have indicated that enterococci play an important role in the ripening of these cheeses, hence contributing to their typical taste and flavour. Adaptability of enterococci to different substrates and growth conditions (low and high temperature, extreme pH, and salinity), allows them to increase in number during milk refrigeration, survive pasteurisation and fermentation. The presence and growth of enterococci in cheeses results in organoleptically unique products, which contribute to the local cuisine and the region’s heritage. Due to interlinked European and worldwide markets, these cheeses are widely distributed and are internationally considered as delicacies. In addition to these technological properties, numerous strains of enterococci associated with cheeses, mainly E. faecium and E. faecalis, produce one or more bacteriocins, and may be considered as protective towards spoilage and pathogenic bacteria. Slovak Bryndza is a natural, white, spreadable cheese manufactured according to the traditional method by milling a lump of matured sheep cheese. The cheese samples were obtained from five different commercial distributors in Slovakia and were taken at three different seasonal intervals. Enterococci are found in high levels; an average value among Bryndza cheese samples ranged between 107 and 108 CFU g−1. Three hundred and eight presumed enterococcal isolates were recovered from Bryndza cheese. All isolates were identified to the species level using phenotypical methods and commercial biochemical sets and by genotypic tools, i.e. polymerase chain reaction (PCR) using ddl genes and repetitive element sequence (GTG)5 in combination with phenylalanyl-tRNA synthase gene (pheS) sequence analysis and by whole-cell protein analysis (SDS-PAGE). Entero­coccal strains were identified as E. faecium, E. durans, E. faecalis, E. italicus, E. casseliflavus, E. gallinarum, E. hirae, and eight strains were members of the species Lactococcus lactis. Of the seven enterococcal species isolated, three of them, E. faecium, E. faecalis and E. durans were present in all samples studied, with E. faecium as the predominant one (50% or more in cheese samples from all producers and seasons as well). Results of biochemical and molecular identification of enterococcal species were in agreement in more than 90%. Since E. faecium was found to be a dominant species in all analyzed Bryndza cheese samples, this species was studied in more details. Pulsed-field gel electrophoresis of macrorestriction fragments (PFGE), (GTG)5-PCR and ERIC-PCR were applied to evaluate genetic diversity within this species. Among 176 E. faecium isolates 82 were plasmid positive. Their plasmid DNA was isolated and digested by EcoRI and HindIII restriction endonucleases. The patterns obtained were compared with those obtained by PFGE, (GTG)5-PCR and ERIC-PCR. Molecular approaches revealed that there is not only a considerable genetic variability among E. faecium isolates among various Bryndza distributors, but even at one distributor at different intervals during 1 year. Plasmid profiling and ERIC-PCR have offered a higher resolution than PFGE and (GTG)5-PCR. PCR was also used for assessment of presence of vanA and vanB genes and virulence determinants gelE, agg and cytolysin genes, namely: cylL L , cylL S , cylM, cylB and cylA. 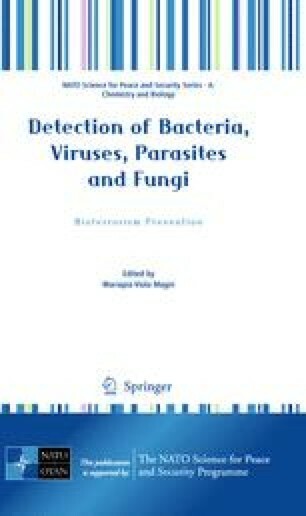 Vancomycin resistance genes vanA and vanB were not detected. Agar plate testing confirmed the sensitivity to vancomycin. Gene gelE, was found in 20 E. faecalis isolates, but only 13 of them showed gelatinase-positive phenotype. Seven isolates had five cytolysin genes, but none of the isolates exhibited a positive haemolytic phenotype. Four isolates possessed the agg gene. All enterococcal isolates from Bryndza cheese were susceptible to ampicillin, streptomycin, gentamicin, vancomycin, and teicoplanin as determined by the disk diffusion method. Resistance rates of enterococcal isolates to rifampicin, erythromycin, ciprofloxacin, and nitrofurantoin were 24%, 26%, 2%, and 1%, respectively. Thirty percent of the E. faecium isolates, 3% of the E. durans isolates, and 12% of the E. faecalis isolates exhibited multidrug resistance. The highest frequency of resistant enterococci was observed in Bryndza produced in winter season. In addition to this, in a close collaboration with clinics, we have shown that application of non-pathogenic E. faecium have an important immunostimulatory and antimutagenic properties and can be a promising method for elimination of pathogenic bacteria in the case of some diseases. Assumption of health benefit effects of Bryndza cheese was confirmed by results of our historically first clinical tests based on a daily consumption of Bryndza cheese during 8 weeks. Statistically significant decrease of total cholesterol and LDL-cholesterol was observed. Since enterococci occur in a remarkable array of environments incl. food and water, are the most abundant Gram-positive cocci in humans (considered at the same time as the most controversial group of lactic acid bacteria) any study of genetic diversity of enterococci could be useful to evaluate their potential risks or benefits. This work was supported by VEGA grants No. 1/1269/04, 1/0114/08, and 1/0132/08, by grant VTP 178/2000, and by grant AV 4/2034/08 from the Ministry of Education of the Slovak Republic.